Our aim is to educate the George Fox community about the importance of the local church and encourage them to invest in one. 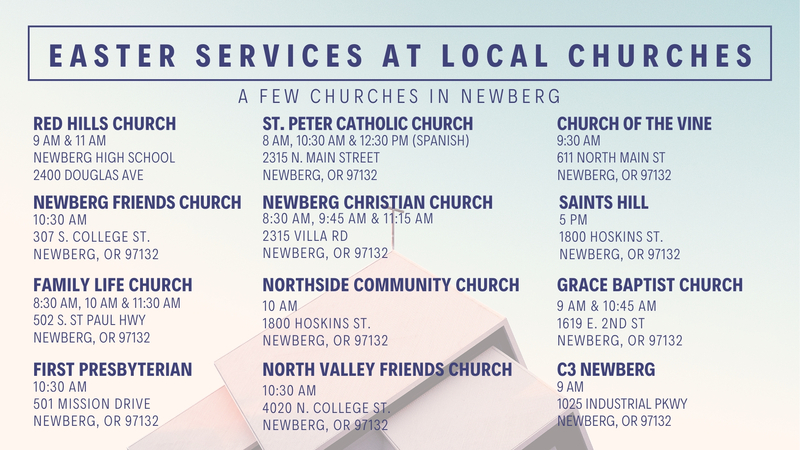 Below is a list of all the Newberg churches as well as some in surrounding cities. The churches listed do not reflect a direct endorsement from George Fox University. Please be prayerful and discerning when selecting a local church. Use the map below to locate churches in the Newberg/Portland area. Click the icon in the upper-left corner to filter churches based on language, location and service times. If you'd like to search churches by denomination, open the map in a new window and use the search tool at the top. 16700 N.E. North Valley Rd. 20500 SW Boones Ferry Rd. 22100 SW Grahams Ferry Rd. 33950 SW Ladd Hill Rd. 5529 NW Five Oaks Dr.
325 NW Baker Creek Rd. Need a ride to church? These churches offer shuttles for George Fox students every Sunday! We host a local Church Connection fair to help students stay connected to the community. This year, the Church Connection Fair takes place after Serve Day on September 12 at 4:00p.m. If you would like to represent your church, please apply using the form posted below. The Committee will review all applications and correspond with churches regarding further details.